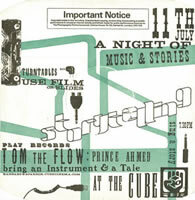 A long while ago I ran an experimental storytelling gig at the Cube Microplex. Everything from telephone answering machines to mixing storytelling records to, of course, people telling- it was a platform for trying things out. Find out more about it here: Le Cirque de Mots. By the way if you made this poster please get in touch with me! I’ve lost your details!